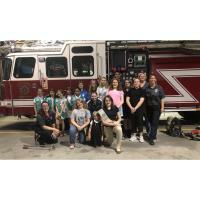 PORT WENTWORTH, GA – October 23, 2018 – Port Wentworth Chamber of Commerce President & CEO Trisha Growe recently arranged for Effingham County Girl Scout Troop 30387 to tour the City of Port Wentworth’s Fire Station No. 2. The group was comprised of Daisies, Juniors and Cadettes and range from elementary to high school-aged students. They are working to earn their First Aid Badge, and the station visit helped them fulfill a requirement and learn more about safety precautions and how to react during medical emergencies. During the troop’s tour on the evening of Oct. 2, members met with Firefighter Jessica Poundstone, who is a certified Fire Safety Educator; Sergeant Amy Headrick, who is a ranking firefighter; and firefighter Jake Decker. They led the girls on a tour through the fire station – which is located at 6781 Highway 21, one mile east of Interstate 95 – and answered multiple questions. Poundstone talked to the girls about basic first aid care, such as how to get help quickly in case of a medical emergency and what they can do to help a sick or injured person until professionals arrive. She showed them the contents of the medical bag that first responders carry when responding to a call regarding someone who is hurt or ill, and demonstrated how to use some of the equipment. After their visit to Fire Station No. 2, the Girl Scouts will continue to work toward their Junior First Aid Badges by creating posters that depict what should be done in the event of an emergency first aid situation. After their visit to fire station No. 2, the Scouts will now make posters about what to do in an emergency first aid situation. Thanks to the firefighters’ input, they’ll have plenty of ideas for what to include in their posters. Port Wentworth Fire Department Fire Chief Lance Moore said he was glad the Scouts utilized the local fire station to understand more about safety and EMS procedures. He stressed that it’s an opportunity that all community members are welcome to take advantage of. “Port Wentworth Fire has two certified fire life safety instructors in the department, Sgt. Amy Headrick and Firefighter Jessica Poundstone. With their guidance, the department strives to communicate the importance of fire safety to not only children, but the entire community. We offer station tours for students, scout troops and others. We offer basic fire extinguisher training to citizens and industries. It is our goal to prevent injuries and property loss from fire throughout the community. We welcome the opportunity to meet with community members. For additional information on any of our programs or to schedule training, give us a call at 912 966-7425,” Moore said.